In the vernacular, 'to be frank' generally means to be honest or straight forward, not pulling any punches. Brooklyn band Frank is exactly that. On their third album, Here Together, they're not necessarily following convention or trying to be hip or modern. Yet, I wonder if the hipster crowd isn't digging this indie band while they sip their Pabst Blue Ribbon. Frank: on the dock, waiting for the next delivery. Frank could be twice removed from the Seventies or Eighties with their simple and direct, polished but minimalist, rock sound. These guys have well-paying day jobs. So this must be labor of love. Fortunately, for us they put out some easy listening melodic rock. Though the song Cracks gets a little heavy, and rowdy, in the latter third. Honestly, the best characteristic of Frank is the simple genuineness of their music. I wouldn't say it's novel, different, or genre bending. But it is compelling for the very same reasons it's none of those things. 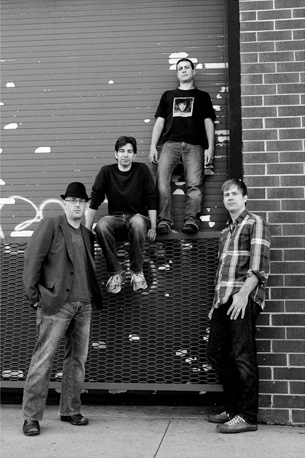 Here's four musicians wanting to simply create music, hoping for an audience, but not caring if it shows up. This is music for music's sake, creativity at its noncommercial best. Good for them, and good for those who buy their stuff or experience them live. Top picks: the aforementioned Cracks, and also Shine, Here Together, Peace Out, and Halo. Strong and entertaining music doesn't always make the mainstream. I don't know what Frank would do with the success anyway. Succumb to fame? I doubt. Recommended. 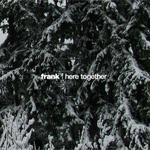 Frank's Here Together, by definition, is the result of four musicians simply doing what the love without regard to convention or trends. This is very nice and entertaining indie melodic rock.